It’s a spotless day in the Wiki Wiki sunglasses by Maui Jim. As a new addition to the Maui Jim aviator collection, we see why the Wiki Wiki are an excellent choice for open-air work and play. 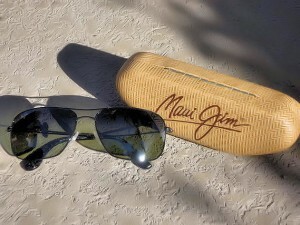 Recent ocean outings and hikes along sun-drenched river banks were more enjoyable in Maui Jim’s Wiki Wiki. Carrying your packs can be a heavy load, it’s nice to lighten up a bit in the Wiki Wiki. Don’t let the lightweight frame pull the wool over your eyes; these glasses are durable and strong, made from pure titanium. The hinges are anti-corrosive so you won’t’ have to worry about getting too close to the ocean spray on your morning jog along the Southern California shoreline. As we slipped in and out of our pack on hikes, the Wiki Wiki didn’t slip off my face; adjustable non-slip silicone nose pads unite with a double bridge design so you can walk comfortably along all the northern bridges along the Sacramento River. We wouldn’t dream of overlooking these lenses, that’s for sure! These polarized lenses will take you north and south. PolarizedPlus2 is a patented, color infused technology that wipes out 99.9% of the glare; you’ll have the competitive edge in the local volleyball game along the beach. As important as it is for folks to put on the sunscreen outdoors, so it is for the eyes as well. The PolarizedPlus2 blocks out 100% of harmful UV light. As temperatures increase this summer, you’ll want to be able to keep your eyes protected. The lens covers the periphery of the eye, protecting the perimeter to the center from wind and UV light. Working with the PolarizedPlus2 technology is a MauiGradient feature coating, allowing an appropriate amount of light to filter certain areas of the lens. Not often do we think about sun glasses helping us to see on dark or foggy days, but Maui Jim does. Maui HT is a High-Transmission system to help you see under darker lighting conditions. We were able to view a family of turtles along the river during a late afternoon hike, and we were really excited about that! Heading out to nature, you will see the full effects of the water falls as Maui Jim has designed a natural grey lens in the Wiki Wiki. Offering color and contrast, whereby normal grey lenses lose color distinctions in the light spectrum. We haven’t scratched the surface on these lenses, and chances are we won’t. Maui Jim knows how active you outdoor enthusiasts can be! Maui Evolution and CLEARSHELL are added features to help protect your glasses. Maui Evolution fuses SuperThin glass and polycarbonate, adding to the lightweight characteristics of the glasses. CLEARSHELL is a silicone-based covering; there to add further protection to the already scratch resistant qualities through Maui Evolution. It’s nice to know if your rugged hikes become too rugged, you have some added protection here. The Wiki Wiki comes in a Hawaiian-print cleaning cloth and hard-cover case. The cleaning cloth is great because it also acts as a soft protective case to put the glasses in before you seal them up in the hard cover case, allowing them to rest before you hit the trail again. Finishing off the glasses for a sleek look is a gloss finish and a HCL Bronze tint. For outdoor sports or socializing, you will want to take the Wiki Wiki with you. So lightweight, you almost forget they are on your face; but so hard at work you won’t see any other way around having them. Aloha! The Wiki Wiki are ideal for those with smaller to medium facial features and sell for a Retail value of $269.00. 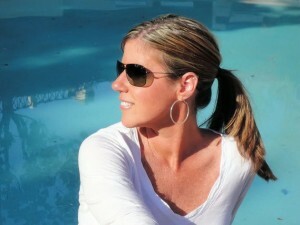 Since Living in Hawaii, Maui Jim are the only sunglasses for me!! They DO reduce glare and therefore the Frequency of Migraine headaches that I have.Nice to see additions added to the line up!! Maui Jim’s are selling better and better to the fashion, as opposed to the sport, set. Winter is closing in on the East Coast and our beachgoers are seeing the sun lower in the sky every day. The polarized lenses from Maui Jim are a lifesaver.